Meet the Beatles for Real: John Lennon returns to Mendips???? No--he goes to Sandbanks to see Mimi! John Lennon returns to Mendips???? No--he goes to Sandbanks to see Mimi! These two photographs of John and Cynthia were sold this past week on ebay. The description said that were from 1967 and were taken outside of John's old house, Mendips in Liverpool. It said that they were taken in the back garden of the house. So this confuses me. You might recall my most embarrassing moment of this blog. When I traveled to Liverpool in 2010 I returned home with the story of a photograph that I saw inside of Paul's childhood home of John Lennon and a girl (looking much like he did in this photo). 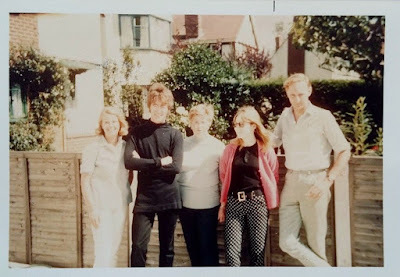 According to the guy that was in charge of Paul's home at the time, he told me that the photograph was taken when John visited Liverpool and was spotted by the girl who lived in the McCartney home at the time. She saw John standing outside of Mendips and ran home to get a camera. I posted this story without doing any research only to have it quickly debunked my Mark Lewishon. I was pretty embarrassed and for some reason the story got shared on a Paul is Dead site, and so I get all sorts of strange comments and questions about it. So now this photo appears. And John is supposedly standing outside of Mendips in late 1967, only I am not so sure it is Mendips. It sort of looks like the house and then it sort of doesn't at the same time. I need some super sleuths on the case to help me out with this one. Edited: See comments section for where this photo was taken! Certainly Mendips but the pics need flipped. Great post. I'm no expert but that's certainly JL with 1967 hair/sideburns and that's certainly Cyn, and the gables and bays look very Mendips area. That aside, I think it's cool you post and remain open to correction - - that is the Best type of research, where you proffer possible details for others to confirm/disprove/adapt. It's how we move forward. Takes some courage to stick yr neck out that way, so more power to you. great snaps of J & C! I beieve the photo is correct this way, no flipping needed. The buttons on the shirt of te guy on the right and Cynthia are the way they shoud be. Doesn't seem te be Mendips. From their clothing I would say it must be July or August 1967. Could it be at Poole on the south coast during one of their visits to Mimi? I have to agree... and I used to see him almost every day in 1967. Lucky teenager! LIZZIE - HOW'S THE ENGLISH TRANSLATION BOOK COMING ALONG? I found the answer!! The photo was taken at Salterns Way, Lilliput, Sandbanks. The woman in the middle was a neighbor of Aunt Mimi and a friend of Mimi's. I stumbled onto the answer when I wasn't looking for it. The woman in the middle's granddaughter posted about it on facebook. Mystery is now solved and closed! Hi MarkZapp. Sandbanks is a tiny part of Poole in Dorset which has the distinction of being the most expensive real estate in the UK on a £ per square foot basis. It's a beautiful seaside resort. A lot of UK celebrities live there. The houses are truly amazing - think UK Beverly Hills. 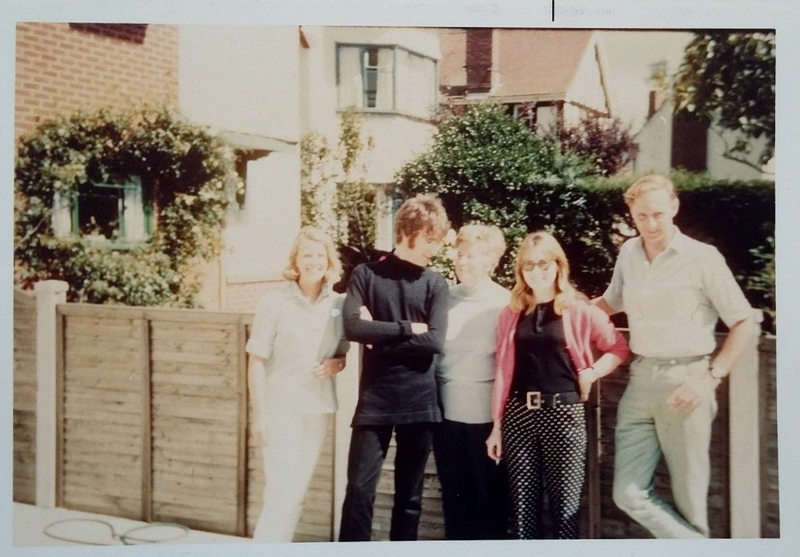 Think it's in Poole summer 67 with friends peter sandeman and fiance and an unidentified lady. Went out on their boat too. I guess the woman’s granddaughter would know, but it sure looks like they’re standing behind a row of semi detached houses - which would be Mendips. The house in Sandbanks was a detached bungalow - nothing like the photo. I lived in Poole, the photos could well be Salterns Way, much has been rebuilt there, and it leads down to a marina. Mimi lived on Panorama Road, to the right of the ferry point. Beverly Hills would be pushing it however.